While Nintendo has yet to provide a definitive date for the release of its flagship title, Mario Kart 8, a retailer in the UK has identified April 25th as the date on which the game will become available. With Mario Kart Wii going down as one of Nintendo’s biggest selling games ever, anticipation for the latest game in the series cannot be underestimated. 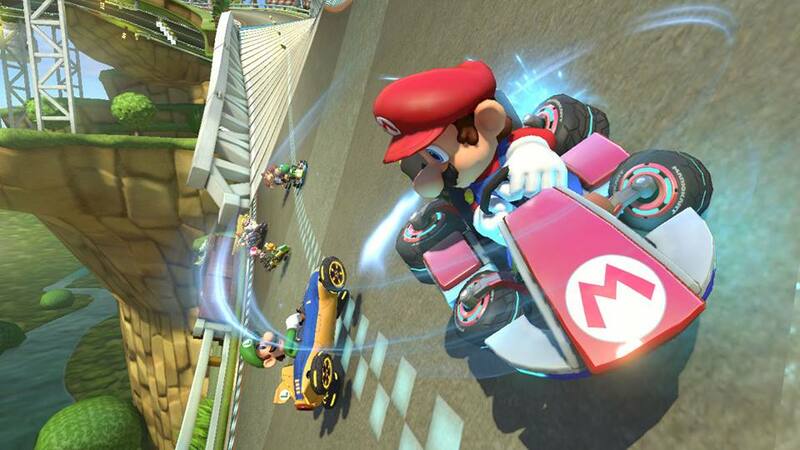 The EAD Kyoto-developed Mario Kart 8 was prominently featured at the time of this year’s E3, with Nintendo unveiling the new feature of hover-powered karts in the game. Although Nintendo has not confirmed April 25th as the definitive date, a recent newsletter stated that the game would arrive sometime in April. Time will tell if the April 25th date proves to be true. 1 day before my birthday, awesome. 1 day from mine as well. weird. Six months away from mine, darn! Two weeks after my birthday, awesome. As a child of Apirl 28th, I’d be very happy to have Mario Kart releasing around the end of April be a tradition. Probably a placeholder date. Either way, I’m looking forward to MK 8. :3 Can’t get enough of Mario Kart! What are your thought’s on the PS4 drm rumor? Which one? From that guy’s video? Most of his “info” is coming from GAF. Yes, the PS4 has DRM. Every form of electronics media these days has some form of DRM. This is something that people do not seem to understand. What I do not agree with is that the PS4 was going to have the same form of always online DRM that Xbox One was going to have. One way to test it: Don’t update the system and play a game on day 1. If the game can play, then rumor instantly debunked. People are saying that Sony backtracked because of all the backlash from Xbox One’s DRM debacle. Before Xbox One was even announced, PS4 was created without that requirement. As I believe it was Shuhei Yoshida brought out, PlayStation is a brand found in many countries where access to the internet is not common and they still want to cater to those areas, so requiring an online connection wouldn’t be wise. Now, I do admit that the day 1 patch is stupid because it is enabling a lot of features that *should* have been included from the start, out of box. I understand *why* this is though: PS4 and Xbox One are being rushed to the market earlier than expected. They are trying to make a cash grab for Holiday 2013. This is the reason that both systems are launching before Black Friday in North America (and a few other regions) and on or after Black Friday in other regions. Personally, I think Sony, Microsoft, AND Nintendo should have waited until their systems, system software/OS, and networks were complete, up, and stable, with a good amount of titles for launch. This would have put all companies for a launch sometime in 2014. Obviously they all did this for business reasons though. I understand their perspective, but each system is bound to have a rocky start – the same way the Wii U did. Thanks for the reply. I hope it all works out well. To me, it wouldn’t matter if they delayed it or not, the longer it takes the better the game. The amount of people stating how close this is to their birthday, and the amount of people born in April, is TOO DAMN HIGH! Apparently July and August are a very fun months. I wouldn’t be surprised if this is the actual date. Sounds realistic enough. Littlewoods? That is so laughable. You might as well ask me for the winning Lotto numbers. You’ll have a better chance. There is no way Littlewoods are privy to this date. Oh and if you did buy from them expect to pay well over the odds for the game. They’re renowned for being expensive. Mario kart wii came out on the 27th in 2008. It’s possible.